I'm having a little breather from jewellery making today to show you a really easy DIY you can do to give your home a little bit of love. I wanted to create something that was on the whimsical side and the sort of thing you might find hidden in a random box at the back of a second hand shop. Why? I just did. I have had mine hanging by my fire place for the last week or so and despite knowing its a little wrong it makes me smile everytime I look at it. All the steps are below. You'll need; Thick florist wire, thin florist wire, bias binding, double sided tape and a selection of ribbons. Step 1. Very roughly measure decide on the length you want the side of your heart. Using something round create a circle shape. Bend your wire back in itself and then wrap around your circle shape again. Step 2. Pull the two sides of your heart together and overlap. Bend one piece of wire back over onto itself and then repeat with the other. Snip off any extra length with your pliers. Step 3. Taking your bias binding (I couldn't find any narrow bias binding so I cut mind in half down the center) apply your double sided tape. 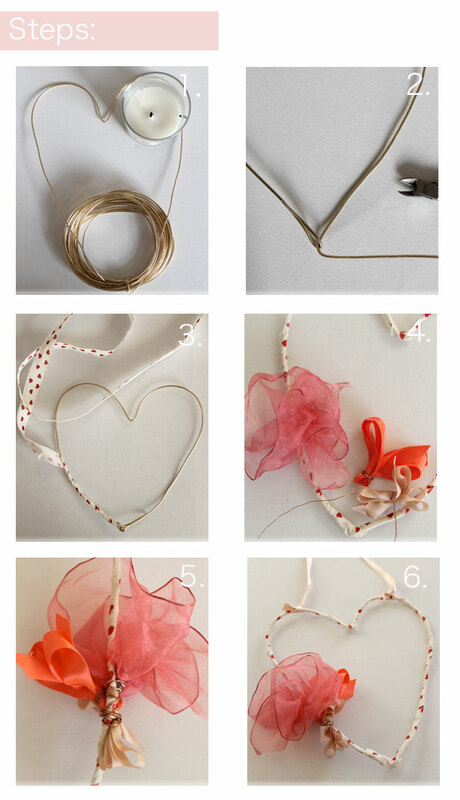 From the point, peel the backing of the tape away and wrap the ribbon around your wire heart. Step 4. 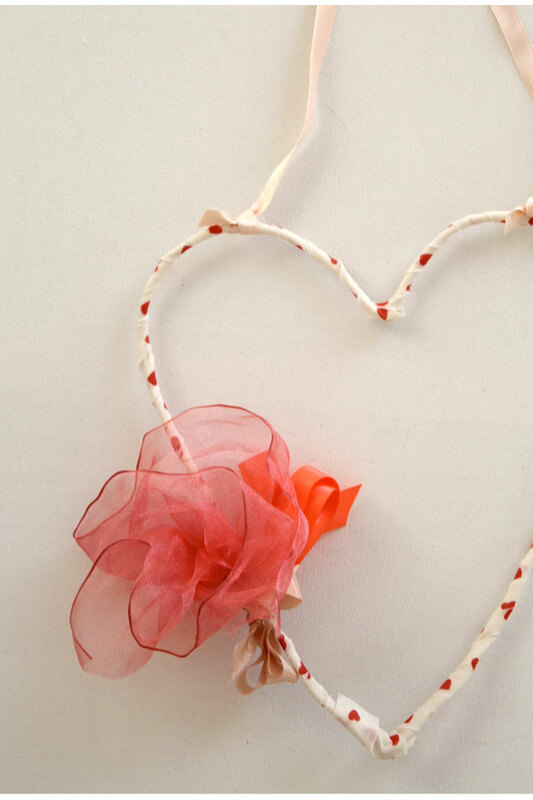 Taking your ribbon make some random flower shapes using thin florists wire. These don't have to be too perfect, I wanted mine to look quite naive. Step 5. 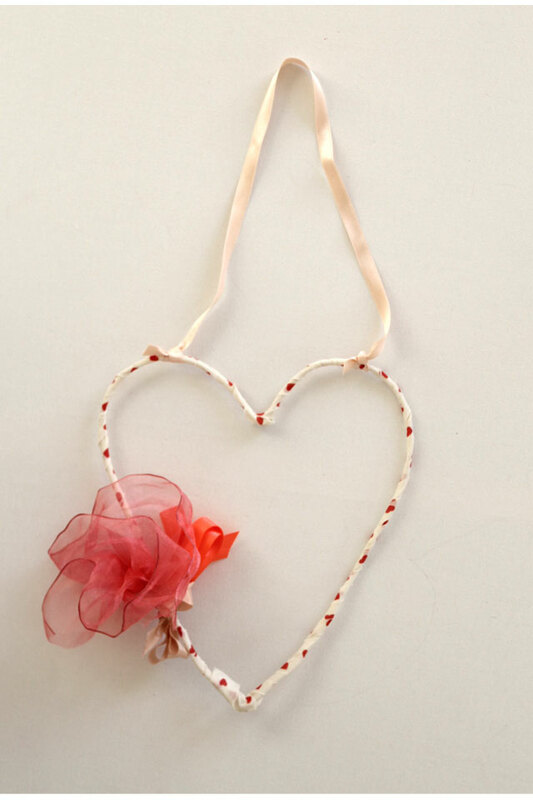 Using your fine florist wire wrap them onto your heart in your desired position. Step 6. Fix some more ribbon to the top of your heart and you are ready to hang. I really love the raw uncovered gold version, so if you want to keep this really plain you can. I also think grey with yellow would look rather pretty too. Happy Making! This is one of those "why didn't I think of that?" moments. A great idea!